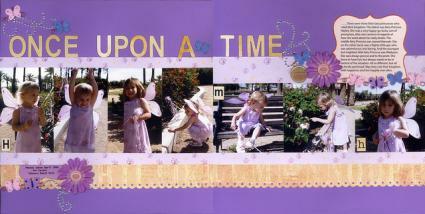 Incorporating your favorite TV shows into your scrapbook layouts is an excellent way to showcase special pictures. 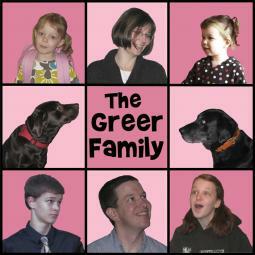 Many popular TV shows are easily applicable to everyday scrapbook themes, such as family, pets, and vacations. Papers and embellishments featuring popular children's show characters are relatively easy to find at any craft store or specialty scrapbooking website. Another fun idea to incorporate your kids' favorite shows is to ask them to draw some scenes and characters that they love, and include the artwork in your layout. Try some of these show-specific ideas, too. 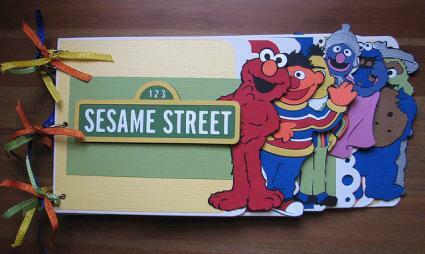 If you're making a scrapbook for a young child, a Sesame Street theme is sure to be a hit. A Cherry on Top has a large assortment of Sesame Street embellishments for your scrapbook. Here are a few ideas for how to incorporate Sesame Street themes into your layouts. Baking: Decorate a page about your toddler's attempts to help you make cookies with a Cookie Monster sticker or die cut and a title that says "C Is for Cookie." Messy Rooms: Document the struggle to get your child to clean up his room with a page that showcases the mess next to an Oscar the Grouch sticker, die cut, or drawing and a title that says "You'd Be Grouchy Too if You Lived in a Trash Can." Bath Time: Use "Hey Rubber Ducky, You're the One. You Make Bath Time Lots of Fun!" as your page title and embellish pictures of your child taking a bath with images of Ernie and his beloved rubber ducky. Going to Preschool: The Count loves to learn, so he's the perfect accent for a layout about your child learning his numbers in preschool. SpongeBob SquarePants and the gang from Bikini Bottom are a cute way to accent pages about going to the beach, enjoying a tasty "Krabby Patty" burger, or hanging out with a friend who knows all your faults but loves you anyway. ArtFire has a beautifully designed SpongeBob SquarePants digital scrapbooking kit that includes 15 papers, 26 graphics, 208 elements, quick page templates, and a 4x6 bragbook for just $5. The SpongeBob Quotes website has a directory of character quotes that you can incorporate into your journaling. If you have a curious little girl, a page titled "Adorable Explorer" or "There's More to Explore" could feature Dora embellishments next to photos of her in the midst of exploring your backyard, the city park, or a stop on your last family vacation. 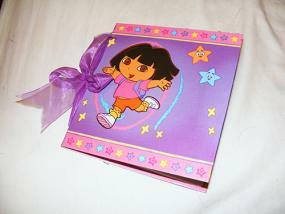 The Dora the Explorer page kit that includes six sheets of 12" x 12" patterned paper, two flat sticker sheets, and one sheet of gem stickers. You could also create a replica of Dora's backpack out of purple felt, and fill it with your child's artwork or extra photos. Thomas the Tank Engine can be used to accent a page talking about how your child is "Really Reliable" or "Really Useful" when it comes to helping out around the house. Make a list of the different chores your child does, such as helping to set the table or sorting the darks from the lights before you do laundry. Take photos of your little helper in action and add a border of train stickers to complete the layout. Totally Thomas has a large assortment of Thomas the Tank Engine stickers that are suitable for scrapbooking. Try mounting the stickers on cardstock squares or using foam adhesive to visually lift them off the page and add interest to your layout. Unfortunately, most licensed scrapbook supplies are designed to appeal to children. If you want to make a layout with an adult TV show theme, you'll need to be a little more creative. If you don't have many photos from an event but have lots of information to share, making a Jeopardy style game board is an excellent way to share important details in a fun and engaging way. Place questions and answers in the traditional Jeopardy format in some of the game board squares, photos in others, and memorabilia or quotes in the rest. Visit fontmeme.com to download a free Jeopardy font for your page title. 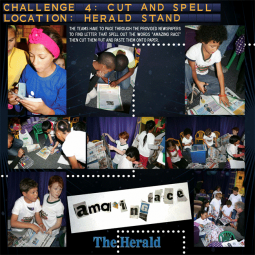 Document your travels around the world with an Amazing Race inspired layout. Make small race flags by folding strips of washi tape over toothpicks, or create route markers out of red and yellow paper scraps. Decorate yellow envelopes with a black stripe and white and yellow block lettering to mimic the challenge envelopes used on the show. Attach the envelopes to your layout to provide extra room for hidden journaling or memorabilia storage. Redbubble has a "Soft Kitty" sticker inspired by The Big Bang Theory that you could use to decorate a page featuring funny photos of your cat. You could also make your own "Soft Kitty" background paper by printing the lyrics to the song across a solid colored background using Impact, which is the font used to create the show's logo. Red and white mimics the show's logo, but you could certainly use other colors if those match your photos better. If you're a fan of the show Once Upon a Time, Redbubble designer Qistina Iskandar has a sticker with a quote from Mary Margaret that reads, "Believing in the possibility of a happy ending is a powerful thing." This would be an appropriate accent for any wedding, anniversary, or love themed scrapbook page. Although it is not made specifically for the television show, the Once Upon a Time Paper Stack from Die Cuts with a View has glitter accented fairytale themed papers that would be perfect for this type of layout. Zazzle designer Wheedesign has created an "Executive Chef" sticker designed to mimic the Top Chef logo. This sticker comes in 3-inch or 1 ½-inch sizes and could be used as part of a page title or journaling block on a layout showcasing your favorite recipes or a photos of a particularly impressive meal that you created. Wiki Quote has some quotes from past Top Chef guests and contestants that you could incorporate into your page as well. Although TV themed patterned papers, stickers, or embellishments can be a fun way to add visual interest to your scrapbook page, remember that they should never overpower your photos and journaling. You want your memories to be the focus of your layout -- not the supplies you've purchased.